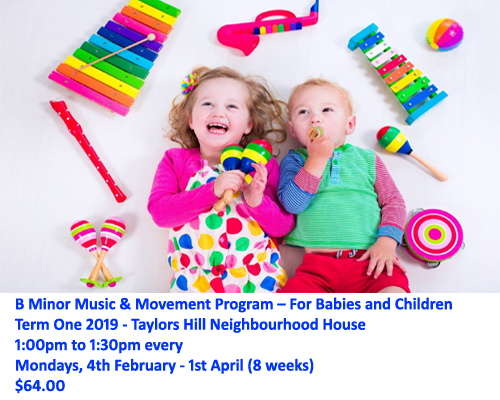 B Minor Music is a music program for children. Sessions are fun, interactive and educational and are led by an experienced early childhood educator and trained performer who is passionate about educating children through performance. Sessions are jam-packed with singing, puppetry, dancing, action songs, rhymes, stories, felt board characters and musical instruments. The groups are interactive, inclusive and full of fun with all the props and instruments provided. The children are encouraged to play a big role in choosing what they would like to do each session, providing a happy balance between old favourites and the introduction of new experiences. COST: $64.00 (8 classes). Children under 12months of age are welcome to attend free with an older paying sibling.